Abstract: A field experiment with the 35–1 fractional factorial design and five factors (k = 5) at three levels (s = 3) was performed in 2007–2010 at the Agricultural Experiment Station in Bałcyny, north-eastern (NE) Poland. The results of the experiment carried out under the agro-ecological conditions of NE Poland confirmed the high yield potential of common wheat and satisfactory yield potential of spelt and durum wheat. On average, durum wheat and spelt yields were 2.14 and 2.55 t/ha lower, respectively, than common wheat yields. Sowing date was not correlated with the yields of analysed Triticum species. Seed rate (350, 450 and 550 seeds/m2) had no significant influence on the grain yield of winter cultivars of common wheat, durum wheat and spelt. Common wheat cv. Oliwin and durum wheat cv. Komnata were characterized by the highest yields in response to nitrogen (N) fertilizer rates calculated based on the Nmin content of soil. An increase in the spring fertilizer rate by 40 kg N/ha in excess of the balanced N rate was not justified because it did not induce a further increase in the grain yield of common wheat and durum wheat. The grain yield of spelt cv. Schwabenkorn continued to increase in response to the highest rate of N fertilizer in spring (40 kg N/ha higher than the optimal rate). Intensified fungicide treatments improved grain yield in all Triticum species. Abstract: It is challenging to predict the changes in weed flora that may occur because of changes in global climate. Limited data are available on the effect of climate change and drought conditions on weed flora and their competitiveness in Southern Europe. Future predictions by scientists indicate reduced and untimely rainfall, along with increased temperatures in this region. Weeds possess a variety of developmental and physiological mechanisms, including senescing, increased leaf cuticular wax deposition, well-developed palisade parenchyma in the leaves, high root/shoot ratio, stomatal closure, peroxidase accumulation and symbiosis with endophytes that enable them to adapt to drought and high temperatures. Because of high adaptability of weeds to adverse environmental conditions, it can be assumed that under future warmer and drier environmental conditions, their growth will be favoured, while the competitiveness of vegetable crops against weeds will be decreased. It is important to highlight that the predicted decrease in overall rainfall levels throughout the year may lead to increased problems of herbicide residues (carryover effects) to following crops. The current paper provides an up-to-date overview of the adaptation mechanisms of weed species commonly found in Southern Europe, in order to expand the available knowledge regarding their response to drought and elevated temperatures. Emphasis is placed on revealing the effects of drought and increased temperatures on vegetable–weed competition and, most importantly, its effect on vegetable crop yield. Abstract: Although application of organic fertilizers has become a recommended way for developing sustainable agriculture, it is still unclear whether above-ground and below-ground crops have similar responses to chemical fertilizers (CF) and organic manure (OM) under the same farming conditions. The current study investigated soil quality and crop yield response to fertilization of a double-cropping system with rapeseed (above-ground) and sweet potato (below-ground) in an infertile red soil for 2 years (2014–16). Three fertilizer treatments were compared, including CF, OM and organic manure plus chemical fertilizer (MCF). Organic fertilizers (OM and MCF) increased the yield of both above- and below-ground crops and improved soil biochemical properties significantly. The current study also found that soil-chemical properties were the most important and direct factors in increasing crop yields. Also, crop yield was affected indirectly by soil-biological properties, because no significant effects of soil-biological activities on yield were detected after controlling the positive effects of soil-chemical properties. Since organic fertilizers could not only increase crop yield, but also improve soil nutrients and microbial activities efficiently and continuously, OM application is a reliable agricultural practice for both above- and below-ground crops in the red soils of China. Abstract: Quinoa (Chenopodium quinoa Willd) is a dicotyledonous annual species belonging to the family Amaranthaceae, which is nutritionally well balanced in terms of its oil, protein and carbohydrate content. Targeting-induced local lesions in genomes (the TILLING strategy) was employed to find mutations in acetolactate synthase (AHAS) genes in a mutant quinoa population. The AHAS genes were targeted because they are common enzyme target sites for five herbicide groups. Ethyl methane sulfonate (EMS) was used to induce mutations in the AHAS genes; it was found that 2% EMS allowed a mutation frequency of one mutation every 203 kilobases to be established. In the mutant population created, a screening strategy using pre-selection phenotypic data and next-generation sequencing (NGS) allowed identification of a mutation that alters the amino acid composition of this species (nucleotide 1231 codon GTT→ATT, Val→Ile); however, this mutation did not result in herbicide resistance. The current work shows that TILLING combined with the high-throughput of NGS technologies and an overlapping pool design provides an efficient and economical method for detecting induced mutations in pools of individuals. Abstract: Noy-Meir's simple but insightful model of grazing-system dynamics was used to draw broader inferences from empirical data generated by a 17-year field trial with beef cattle grazing a Mediterranean grassland in northern Israel. After calibration of its parameters against the field results, the model predictions were tested against an independent set of data obtained from the study site; they were within acceptable deviations from the inherently noisy field data. The calibrated model was used to analyse the effects of changes to two key grazing-management factors – stocking density and early-season grazing deferment – on biomass dynamics and forage consumption. The simulated results were used to calculate forage deficits and supplementary feed requirements for optimum herd performance during the growth (‘green’) season and throughout the year. The results revealed a critical stocking density of 0.7 Animal Units (AU)/ha, above which early-season deferment reduced the amount of supplementary feed required to maintain the optimum production of the herd. Optimum stocking is higher when the grassland is used mainly in the highly nutritious green season. 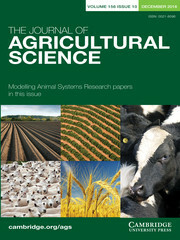 Responses of the strongly seasonal Mediterranean grassland to the interaction between stocking density and early-season grazing deferment were expressed by a calibrated model, in terms that determine the efficiency of forage supplementation of the herd during the green season and throughout the year. Abstract: The objective of the current paper was to apply mixed models to adjust the growth curve of quail lines for meat and laying hens and present the rates of instantaneous, relative and absolute growth. A database was used with birth weight records up to the 148th day of female quail of the lines for meat and posture. The models evaluated were Brody, Von Bertalanffy, Logistic and Gompertz and the types of residues were constant, combined, proportional and exponential. The Gompertz model with the combined residue presented the best fit. Both strains present a high correlation between the parameters asymptotic weight (A) and average growth rate (k). The two strains presented a different growth profile. However, growth rates allow greater discernment of growth profiles. The meat line presented a higher growth rate (6.95 g/day) than the lineage for laying (3.65 g/day). The relative growth rate was higher for lineage for laying (0.15%) in relation to the lineage for meat (0.13%). The inflection point of both lines is on the first third of the growth curve (up to 15 days). All results suggest that changes in management or nutrition could optimize quail production. Abstract: Integrated crop-livestock systems (ICLS) are currently promoted agricultural production systems that aim to use better resources through production integration and intensification. While this system reduces some risks, it adds complexity and new risks to businesses due to interdependence between the agricultural modules. To deal with these issues, integrated risk management is required to reduce the effects of risks and to take advantage of the opportunities of an ICLS. Generically, enterprise risk management (ERM) meets this need by proposing comprehensive and coherent risk management, instead of managing agricultural module risks individually. However, there is a need to customize the ERM approach to ICLS. Therefore, the current study aims to develop a method to manage risks for ICLS based on ERM, integrating the management of risks and aligning risk management with the strategic objectives. A literature review, a pilot study, interviews with experts, four case studies and 20 practitioners supported the method development and evaluation through three versions. As a result, the method identifies and relates risks through process mapping with a qualitative and quantitative analysis of their impacts, determines risk responses based on willingness to take risks, and helps identify processes to control, communicate and monitor the risks. The method also stimulates the implementation of ICLS in market-oriented farms, providing an approach to increase the chances of ICLS success. The main difference from previous research lies in the integrative management of multiple risks, the alignment of risks with strategy and the consideration that a risk might be considered an opportunity. Abstract: Non-decorticated sunflower meal (SFM) is a potential protein source for dairy cows with high-fibre content but high ruminal degradability. The effect of replacement of soybean meal (SBM) and wheat middlings (WM) with SFM on the intake, digestibility, microbial protein synthesis, nitrogen utilization and milk production of dairy cows was evaluated. Twelve Holstein cows were blocked by days in milk and distributed in three 4 × 4 Latin squares. Diets were formulated to be isonitrogenous and contained 550 g maize silage/kg dry matter (DM). Treatment diets were no SFM (CON) or 70, 140 and 210 g/kg DM of SFM replacing fixed mixture of SBM and WM (536 and 464 g/kg of the mixture, respectively). The inclusion of SFM in diet did not affect DM intake, but intake of rumen degradable protein increased linearly. Inclusion of SFM reduced or tended to reduce total-tract digestibility of non-fibre carbohydrate, total digestible nutrients and excretion of purine derivatives. Milk production, milk protein content and efficiency of nitrogen use for lactation were reduced with increasing levels of SFM in the diet. The use of non-decorticated SFM as a replacement for SBM–WM mixture in diet reduces performance and efficiency of nutrient use in lactating dairy cows. The outcome of the current study is attributed to reduced fibre digestibility in SFM hulls. Therefore, future studies should evaluate the use of decorticated SFM. Abstract: Differences in forage nutritive value between morning and afternoon are related to patterns of dehydration and carbohydrate accumulation throughout the day. In this way, management strategies that maximize grazing time during the afternoon could increase forage nutritive value and consequently nutrient intake. The aim of the current experiment was to evaluate the effect of the time of day (06.00 h [designated AM] or 15.00 h [PM]) that cattle are moved to a new paddock on forage nutritive value, grazing behaviour and animal performance of beef cattle on rotationally stocked Marandu palisadegrass (Brachiaria brizantha cv. Marandu Syn. Urochloa brizantha cv. Marandu) pastures. A spring and summer study was conducted in Pirassununga, SP, Brazil from October 2012 to March 2013 (182 days). Treatments were distributed in a randomized complete block design with three replications. Herbage mass, morphological composition, herbage allowance and stocking rates were similar between treatments during spring and summer. Moving animals to a new paddock, regardless of the time of day – 06.00 h (AM) or 15.00 h (PM) – stimulated grazing, modifying the distribution of meals throughout the day. However, compensatory mechanisms among grazing time, bite rate and forage nutritive value throughout the day operated in order to generate similar performance between animals offered a new paddock in the morning or in the afternoon. Abstract: The use of cactus cladodes in animal feed is well-established in semi-arid areas. The cactus Nopalea cochenillifera (L.) Salm-Dyck cladodes (Nopalea) have high acceptability amongst dairy cows and are resistant to carmine cochineal insects (Dactylopius opuntiae Cockerell), a problem in semi-arid regions, but in regions of prolonged drought, it has lower productivity compared with the cactus Opuntia stricta (Haw.) Haw cladodes (Opuntia), which is also resistant to the insect. The objective of the current study was to evaluate the intake and content of digestible material of dry matter (DM) and its components, feeding behaviour, microbial protein synthesis, nitrogen balance, blood parameters, performance and milk composition of Holstein cows fed a control diet, containing either Nopalea or Opuntia associated with different concentrate levels (225, 275, 325 and 375 g/kg). Ten cows with an initial average milk production of 20 ± 2.1 kg/day were distributed into a double 5 × 5 Latin square design. Diets containing 775 g roughage/kg and 225 g concentrate/kg promoted similar responses to the analysed variables regardless of the cactus cladode used, except for digestibility of neutral detergent fibre. Diets containing higher proportions of concentrate (325 and 375 g/kg) promoted greater DM intake and 3.5% fat-corrected milk yield. The diet containing Opuntia at 775:225 g/kg roughage:concentrate proportion is as effective as the control diet for Holstein cows producing 20 kg of milk/day. To promote greater milk production, higher proportions of concentrate should be added to diets using Opuntia.